In order to see what a previous version of an application looks like, developers often have to actually rebuild that earlier version. This process could take days, which prevents teams from releasing new functionality, negatively impacting customer relationships and therefore revenue. Today, Applitools released its UI Version Control system to address that problem. A version control system for user interfaces will enable users of the system to view the entire history of web and mobile application user interfaces. They will also be able to see when things have been changed and by whom. According to the company, this is the first time this level of visibility is being made available to developers, test automation engineers and product managers. This type of visual record allows R&D and product teams to intelligently drive application development by showing which features have worked and which haven’t in the past, the company explained. “We were amazed that, with so many businesses driving the bulk of their revenue through web and mobile apps, there wasn’t a way for product teams to track the visual evolution of the UIs,” said Adam Carmi, co-founder and CTO of Applitools. The Applitools UI Version Control system works similarly to source code version control systems. 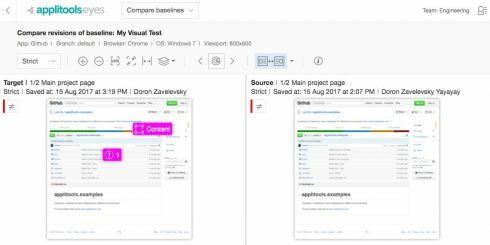 The solution runs visual tests as part of the GitHub build process as well as performing visual validations for GitHub pull request, preventing visual bugs from being released in production apps. According to the company, users will be able to merge visual baseline branches in the same way that code changes are merged. For each branch, users will be able to see a complete history of test baselines, compare to previous baselines, and revert to earlier versions. This will enable users to see if a code commit hurts user experience or revenue generation, and make a fix if necessary. This type of visibility enables more frequent releases, insight into code changes, ability to use application features as experiments, and de-risk use-facing aspects of digital transformation projects, Applitools explained. Previous articleIntroducing the iOS 12 Launch Party!